On the 22nd of June 2017 we went on our Student Council School trip to meet the Cork County Mayor, Seamus McGrath. 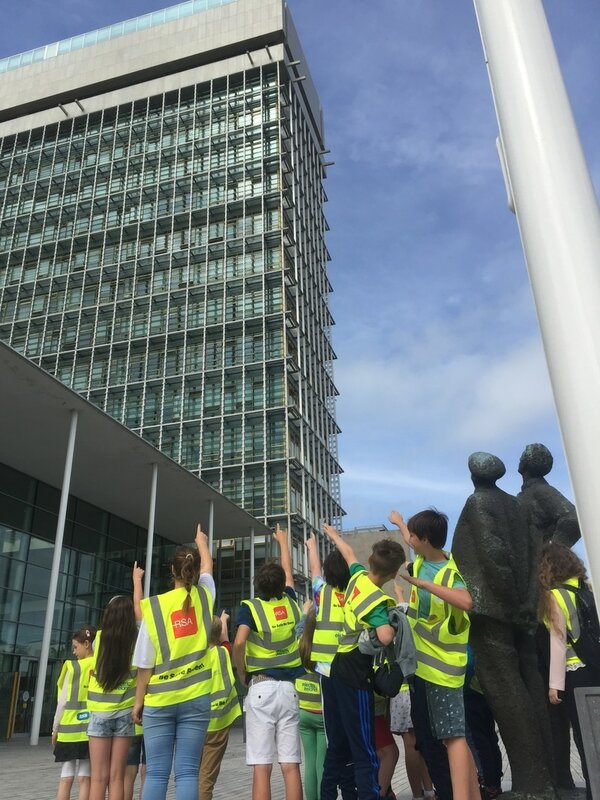 We visited him in the County Hall where the County Council is based.The County Hall was the tallest building in Ireland until 2008, when the Elysian was built. After he introduced himself, he brought us all upstairs to the chamber, where the council have their meetings. The chamber was a big oval shaped room that had fancy chairs and microphones for everyone. We stayed in the chamber for around 30 minutes, which we spent interviewing Seamus McGrath. We all sat around the the room in the places meant for all the politicians. All of our lovely members enjoyed asking the creative questions we came up with. Seamus McGrath decided to show us his necklace with all the past mayor names on it. He explained that he used to hammer to keep order in meetings. We would like one of those for our meetings! He explained all about his role and responsibilities as mayor. He also showed us the highest room in the building, on the seventeenth floor, which has a lovely view of all of Cork. Then we headed down the stairs, and to our surprise the Council had prepared a small gift bag for everyone. They consisted of a bag of crisps and a chocolate bar as well as a juice bottle. After our visit to the Cork County hall we took a trip down the road to Fitzgerald's Park where we ate some more of our lunch ,played a few games. We also went to the playground which was enjoyable for our younger members of the council (and some of the older ones too!). All in all we had a wonderful day and more importantly we learned many many new things. Alot of us felt very inspired after our visit, and a few of us decided to run for mayor when we are old enough! Thank you to Ann-Marie and Pam for making all of this possible! We would also like to Thank the Board of Management who kindly paid for the bus to the County Hall to say thank you for all our hard work.